earned 75 cents a share on revenue of $747.7 million, while analysts were looking for EPS of 70 cents on revenue of $736.1 million. Comparable sales rose 18% on a constant-dollar basis, above the 13.9% consensus estimate. Same-store sales rose 7%, while direct-to-consumer net revenue rose 46%. Gross margins increased 240 basis points to 54.4%. For the fourth quarter, lululemon expects to earn between $1.64 and $1.67 a share on revenue of $1.115 billion to $1.125 billion. Consensus calls for EPS of $1.65 on revenue of $1.12 billion. So what gives? Was it the stock’s then 70% ytd gains into the print, positive sentiment from the Wall Street analyst community and rich valuation relative to peers and the market? Possibly all of the above, but I think it is also safe to suggest that the broad market was in the throes of a global sell-off following the disappointment of trump to nail down a substantive trade deal the week prior at the G-20. Shares of LULU trade at about 33x next year (FY 2020) expected eps growth of 18% on 14% expected sales growth. This compares to Nike (NKE) trading at 27x expected next year (FY 2020) eps growth also of 18% on 8% expected sales growth. LULU seems a tad rich to one of its main peers on an eps basis. But it is worth noting that LULU is a $19 billion market cap company, trading at about 5x its expected 2020 sales of $3,7 billion vs NKE which sports a $130 billion market cap and is expected to print close to $43 billion in sales next year. Last week shares of NKE dropped 6.6% on March 21st following earnings and guidance found disappointing. So what to expect from LULU? I would be surprised to see the stock up 10%, in line with the implied move on a beat, without a material bump in forward guidance, while I could easily see the stock down 10% on a miss and a guide down. 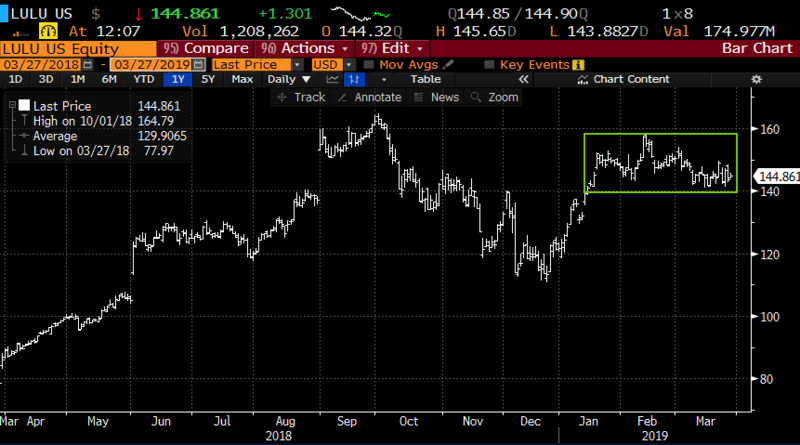 Obviously, the magnitude of the guide will be the determination on the move, but with the stock’s recent consolidation, and NKE’s reaction to its recent results, I suspect the risk is to the downside following the print. Rationale: risk-reward on long premium directional prints in a name like this into an event with options premiums where they are is not great, risking 1 to possibly make a little more than 2 is not an ideal relationship. Rationale: Again, this trade idea has an only ok risk-reward, as long premium directional trades are challenged with implied volatility where it is into the print.